Hi! I’m Michelle! 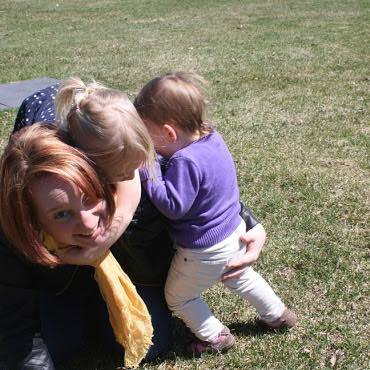 I’m a mom to two beautiful little girls who give my life an abundance of joy and well…I’m blissfully happy! But, it hasn’t always been that way! Like so many parents I meet these days, when I became a new parent I just lived day by day! Nap…or lack of nap, by lack of nap. By the time my Jorja was 5 months of age, I was sleeping in 20 to 40-minute chunks and I was venturing into a place of desperation and exhaustion that was dark and hopeless. I just couldn’t believe that there was no light at the end of this sleepless tunnel! Until, I met a sleep coach. Not only did she tell me she could help…but she DID! Within two weeks, my baby was no longer crying from exhaustion and fighting sleep. She’d slept in her crib for the first time and she was happier during her day! Better yet- I was turning into the MOM I always knew I could be for her. We’d turned around a situation that felt like it was killing me and destroying my marriage into blissful nights of rest and recovery from the amazingly hard job of parenting. Fast forward two years, and I found myself giving birth to a second daughter, who thanks to my knowledge of sleep, was sleeping through the night at just 11 weeks of age! All on her own! I knew right then, that I was meant to share this gift with others. I trained, mentored and certified as a certified sleep coach, and Lovebugs Sleep Coaching was born! And I’ve enjoyed years of helping hundreds of families to find blissful sleep for their families and healthy and restorative self-led sleep strategies for their children. And for me…a career that has been SO blissfully rewarding! In 2013, I started to develop some health problems, shortly after giving birth for the second time. Tingling and numbness in my feet, insomnia (ironic, I know!) and a daytime fatigue that was all encompassing. Tests and medications started then, and it would be years of specialists, increasing severity of my symptoms, MRIs, CTs, ultrasounds, and various other tests, to get nowhere! I found myself sick, tiered and unable to even help my kids do up their jacket. But I was ‘healthy” in the eyes of every doctor I saw. I found myself yet again, anything but the vibrant and joyful mom I’d always known in the core of my being that I was destined to be! When my doctor finally said the word “Fibromyalgia” I knew that I needed to take things into my own hands. I researched like crazy and investigated my symptoms and started on a radical change to my diet and daily nutrition and committed to a complete overhaul of the way I was leading my life. I started yoga and meditation and I worked on ME for months and months. And you know what…along the way, I started to heal! I found the help of new medications that allowed me to deal with my pain better and bit by bit, I started to find wellness! Along the way, I realized that I had high functioning anxiety and depression. I wasn’t shocked to discover this at all. After all, I knew that the grief of losing my mom to Cancer had changed me. Years of stress and caring for others had worn me down. Until finally my body couldn’t take the abuse any longer. When I started listening to my body, I discovered everything I needed to heal and to find my way back to wellness, energy, joy and wellbeing. I found my joy and bliss as a mom again! And I knew right then…I needed to share this too! In 2017, I completed an intensive 6-month Health coach certification and my new business, Bliss Wellness & Sleep was born! It is my pleasure to work with families in Ottawa, and beyond, to create a life that is GOOD! Full of all things that matter in life- health, happiness and LOVE. For our children and for ourselves! And in the Summer of 2018 the business expanded further to bring on a new sleep coach, Tara Cronkwright. Tara is a huge asset to my business and as a past client it's been a privilege for me to help her learn and grow as a sleep coach. I'm thankful to have her join my team and efforts to bring great sleep to as many families as possible. I hope that we can connect soon, and share more.